WASHINGTON – Earlier this morning, President Trump shocked both Democrats and Republicans alike when he announced from the White House Rose Garden that he’s giving up on the government shutdown, and his “kooky scheme” of building a border wall thanks to a late-night visitation by the spectral reincarnations of three Honduran migrants. For the next few minutes, Trump described a Kafkaesque hallucination in which the three spirits took him on a wild and heartfelt journey of introspection and epiphany that melted his rock-hard heart into a warm, flaccid puddle. 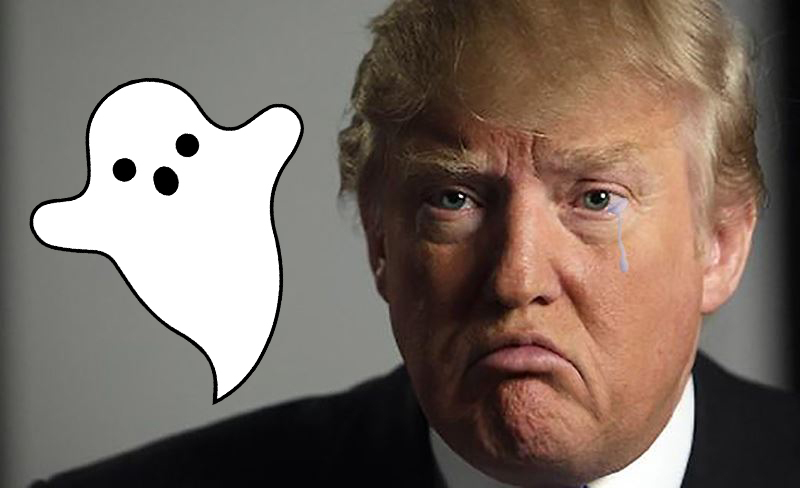 Next, the Ghost of Migrants Present took Trump golfing, and the two of them had a really good time! And finally, the Ghost of Migrants Future ghost-fucked the head of state of one of the most powerful countries in the world into the year AD 3000, where he saw his thirty-three-times great grandson frolicking freely in a windswept Dickensonian prairie as his robotic overlords basked in the solar rays of the Faustian Nexus-12. Trump concluded his Aesopian fable with a moral thtat the American people are unlikely to forget: “The robots are coming, so migration doesn’t matter.” Truly, Faulknerian oration that rivals the likes of Kennedy and Roosevelt in deftness and wit.